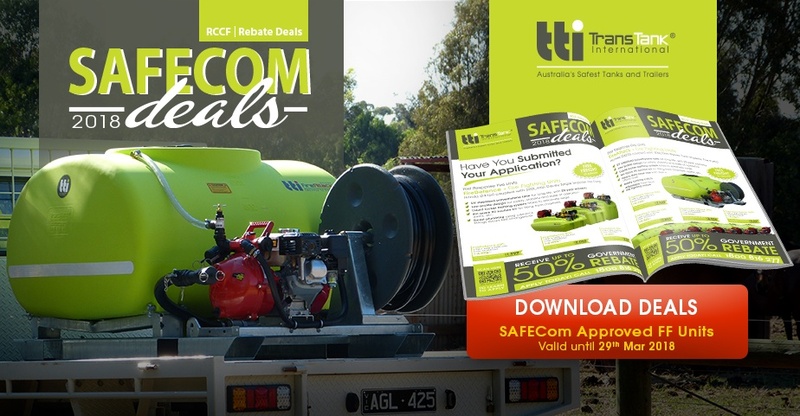 $470,000 is now available for SA Through RCCF SafeCom Grant – March 2018! South Australian land owners can now take advantage of the State Government’s cost share grant scheme for private firefighting and other emergency services equipment. Through SafeCom $470,000 will be made available for South Australians to support the purchase of items that enhance community capability to respond to, and reduce the impacts of emergencies. Individuals, businesses, community groups, not for profit organisations and local government can apply for half the GST exclusive costs of approved items, up to the value of $2,500 GST exclusive. For example, if you purchase a $5,500 unit, you could apply for $2,500 as a rebate! Grant application forms will be available before the grant opens in March 2018. Find out how the RCCF applications will be assessed and how you’ll be notified if your application is successful. Applications for the Regional Community Fund (RCCF) will open on Monday 20 March 2017. There are some specific things we look for in applications, so it’s worth reading the following information carefully before starting your application. Co-funding is available towards the purchase of equipment or goods that enhance community capability to respond to, and reduce the impacts of emergencies that occur in rural, regional and remote communities. You can apply for up to half of the quoted GST exclusive purchase price of items up to a maximum of $2,500 GST exclusive. We encourage you to get your quote from your local region to support the local community. Individuals, businesses, community groups, not for profit organisations and local government can apply. Only one application per physical property address, individual or organisation will be considered. If I have applied in a previous funding round can I apply again? If your application in previous funding rounds was successful or not, you can still apply this year. All applications will be reviewed and assessed on a competitive basis, primarily based on the information provided. An Advisory Committee, including representatives from emergency services, Primary Producers SA and the Local Government Association will assess the applications. Risk factors including access and distance to emergency services. Not all eligible applicants will receive grant funding because we expect demand to exceed available funds. All 2018 applicants will be advised whether they are successful or not in mid-June 2018. Applicants will receive a ‘Letter of Offer’ from us as confirmation. Note: You must wait until you have received the Minister’s advice of approval, before purchasing items. All claims must be finalised within three months of the date of your ‘Letter of Offer’. All previous RCCF applicants will automatically be emailed about the next opportunity to apply for funding. If you haven’t previously applied for funding enter your email details so you will be included in RCCF notification list.